This recipe is perfect for using up leftover ham. 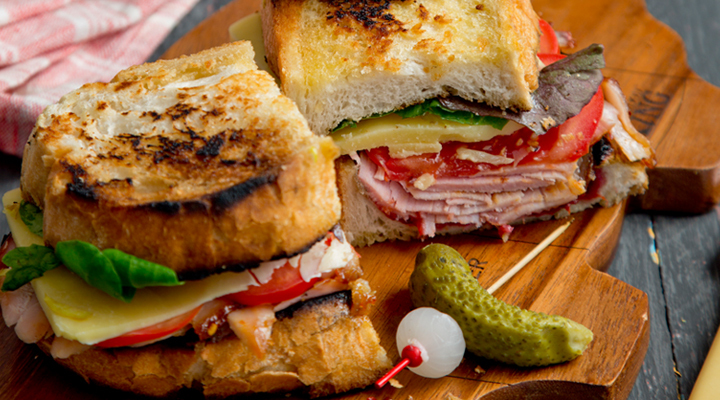 The rhubarb chutney is a lovely alternative to the traditional dark pickles and complements this ploughman's sandwich beautifully, but you could use a strong piccalilli instead. 1.Place all the ingredients for the chutney in a large saucepan. Bring to a simmer and cook, uncovered, for 20 to 30 minutes, until slightly thickened. Remove from the heat and leave to cool. Keep covered until required. 2. When the chutney is ready, prepare the sandwich. Spread each slice of bread generously with the softened butter. Add some chutney and a slice of tomato, some apple slices and lettuce leaves and three slices of cheese for each sandwich. Top with sliced baked ham and enjoy immediately or wrap the sandwich in parchment paper to eat later during the day after a long morning ploughing! Serve with a pickled onion and gherkin on the side or skewered on top with a cocktail stick.